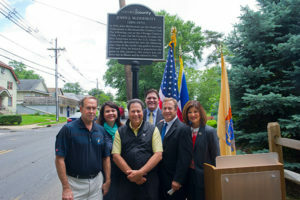 (Cherry Hill, NJ) – The Freeholder Board honored John McDermott, the first American to with the U.S. Open, and the first head professional at Merchantville Country Club. A new sign in commemoration of McDermott’s achievements and contributions was unveiled on Chapel Ave. in front of the club. This is the start of a project that will recognize the contributions of Camden County residents with ornamental markers to build public awareness about the region’s rich history. Freeholder Director Louis Cappelli, Jr. who attended the ceremony, is excited to see the county recognizing one of its greatest champions. He also wants to shine a historical spotlight on some of the little-known key figures of Camden County. In 1911, McDermott became the first American to win the U.S. Open. He won the tournament again in 1912, making him one of just five players to ever win the Open in back-to-back years. McDermott is still the youngest player to ever win the U.S. Open, having been just 19 years old when he was crowned champion. In total, McDermott competed in six U.S. Open Tournaments and placed within the Top-10 finishers in five of them. He retired from professional golf at 23 years old after his ship collided with another during a return voyage from Britain and left him disabled. McDermott was the first head professional of Merchantville Country Club, and he helped to bring the club national recognition thanks to his achievements on the world stage. The club was founded in 1898 as the Merchantville Field Club and McDermott became its first head professional in 1910. The club’s first official clubhouse was later constructed in 1916, the same year that it changed its name to Merchantville Country Club, the title which it has held ever since.